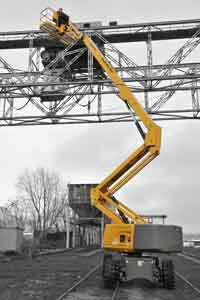 The HA26 range from Haulotte is a versatile machine for multiple applications, one that has been designed to meet the expectations of operators in terms of performance and ensure a cost-effective investment for rental companies. The HA26 range of articulated boom from Haulotte builds on the same design, architecture and performance levels that drove the success of the HA16 and HA20 ranges: no compromises in terms of safety, productivity, ease of maintenance and total cost of ownership! In line with the times and always one step ahead, it also benefits from innovations that set it apart, such as the ACTIV’Lighting System and the STOP Emission System! The HA26 range has been designed to meet the expectations of operators in terms of performance and ensure a cost-effective investment for rental companies. - Landscaping and tree surgery. 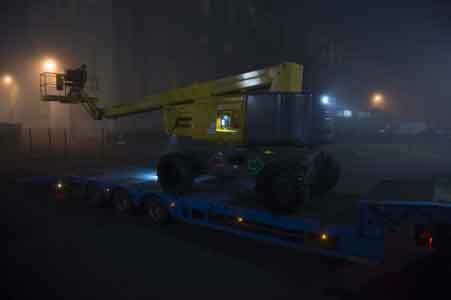 Loading and unloading the boom on a truck is always a delicate procedure, even more so in conditions of limited visibility, such as at dawn or dusk. To simplify this procedure while enhancing user safety, Haulotte Group developed an innovative and ultra-high performance lighting system – ACTIV’Lighting System-Safe Load. 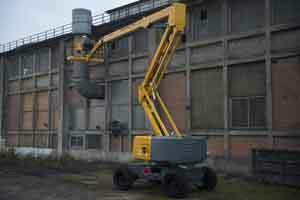 Located at several points around the machine, this lighting system illuminates controls and the area around the boom. Only offered by Haulotte, this is a unique feature becoming an essential element for the safety of both men and equipment. To prevent risks, particularly crushing risks, and protect operators, the HA26 range is equipped with the Haulotte ACTIV’Shield Bar 2.0. The system is now fully incorporated into the upper control protection cover to guarantee better ergonomics and enhanced robustness. Thanks to push forward principle bar, which provides a ‘safety gap’, workers are protected from any risk of crushing without compromising productivity. - Automatic damping of ramp motion when approaching full extension. No jolts, just fluid motion: absolute comfort for users who can work with complete peace of mind. Due to the size of the boom, users may lack visibility when driving, potentially causing accidents. 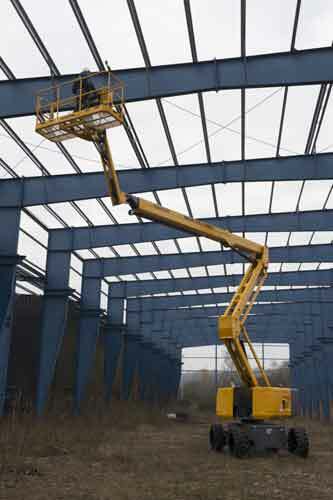 For enhanced visibility, the jib can be raised to a vertical position even when the machine is moving at full speed. Users benefit from greater visibility and save time in their manoeuvres! 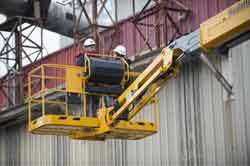 - Excellent 17.5m horizontal outreach to work in hard-to-reach areas. The HA26 range always keeps pace with the productivity that operators demand! Due to machine weight limits, users cannot always load all of their equipment at once. The HA26 range addresses this issue by including a 250 kg/350 kg dual load capacity as an option. In 350 kg mode, the platform can accommodate an extra 40 per cent of equipment by weight. - Gradeability up to 45 per cent. To make life easier for users, Haulotte developed many options to meet their requirements. E.g. Glazier kit, Plumbing kit, Air Line in the platform, Working Light, Non-marking Tires, Lateral Swing Door, Hydraulic Generator, hostile environment kit, etc. When operators are working at a height, the engine often runs for no reason, resulting in the hour meter counting hours unnecessarily. That is why the HA26 range is equipped with the innovative STOP Emission System that automatically stops and restarts the engine Stop Emission System. The system reduces use of the engine and peripheral components by up to 20 per cent, thereby extending the life of the engine and assuring higher residual value. In addition, by decreasing fuel consumption, operating costs are lowered, and overall noise level is reduced allowing operators to work in sensitive areas, such as hospitals, schools, office buildings, etc. The platform and cover hoods are made up of easily dismantled components. In the event of wear, a user needs to only replace the damaged part rather than the entire assembly: simple, quick and more economical. - Modifications of general settings, such as interface language and units of measurement. 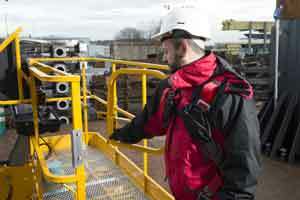 ACTIV’Screen acts as a veritable assistant, supporting users daily in carrying out maintenance operations. For fleet management, the HA26 range is equipped with a universal telematics connector as standard. As it adapts to any type of telematic system, it allows a user to quickly connect their own telematics devices to the Haulotte machines.